Frank Lampard says he understands fans' worries on the rising cost of watching football but thinks legal issues could scupper any attempt to impose a salary cap on Premier League players. The BBC's Price of Football survey highlighted research by Deloitte that shows clubs now spend 71p of every pound they make on staff wages. 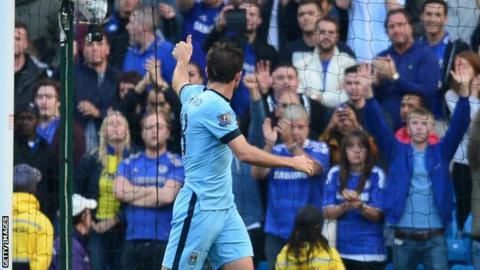 "I don't know if there is a legal minefield on that one," Lampard said. "It might be something they look at but I don't know whether it is possible." The Manchester City midfielder was reportedly third on the rich list of English players at the end of 2013, with a net worth of £31m. But he says he recognises supporters' concerns - and the risk to the game if they are priced out. "If there aren't fans in the stadiums creating those atmospheres, which we get the best in the world of in England, then you're not going to get that generation of TV money as well," Lampard said. "But from being at Chelsea recently and Manchester City now, two of the biggest clubs, they are making big strides. "They are trying to freeze prices. They are trying to put layers in to encourage people from whatever background to be able to come. "I love when they reduce the prices for away games, for certain cup games. "They need to do more of that. If they can kick-start this then that is great. "Because without the fans, then the football doesn't happen." Meanwhile Justin King, the former chief executive of Sainsbury's, said football was running a business plan that let the supporters down. "Any business that thinks it can simply rely upon the loyalty of its customers, regardless of how they treat them, in the end will fail," King said. "Because if you ever start acting in a way that assumes that your customer will keep coming regardless of what you do to them then you'll start doing things that actually are not in your customers' interests." King, who retired in July this year after 10 years as head of Sainsbury's, believes there is more choice available to football fans when it comes to attending matches than some clubs appreciate. "You can make that decision," he said. "Do you go and watch football, or do you watch another sport? Do you watch it in the stadium, do you watch it at home? "Or do you just disengage completely? All of those are choices are available to some fans." The average price of the cheapest match-day ticket in England's top four divisions is now £21.49. It has increased 13% since 2011, compared with a 6.8% rise in the cost of living. And Malcolm Clarke, the chairman of the Football Supporters' Federation, said the way fans were being treated was "unacceptable". "There really is no excuse for it, because the football industry has got huge amounts of money going into it, particularly at the top of the game in the Premier League," Clarke said. "And there's no excuse at all for continuing to push prices up beyond the rate of inflation." While football clubs point to the demand for season tickets still being as high as ever, Clarke said a "generation" of supporters could be lost from the game if the trend continued. "It's not just about market forces. Football clubs are part of the cultural heritage of their local communities. "There is a big danger for the football industry that there will be a future generation which is lost. "Young people, once they're out of the child price ticket category, now very often choose to go to the pub, where they can watch the game for free. "We're going to continue to campaign on it. We want to see prices more in line with those, say, in Germany, and they don't do too badly on the pitch either."